– Yellow is the weakest, with least resistance. – Blue, black and orange offer the most tensile strength. – Lower yourself slowly until you straighten your arms. – Jump up and do it again. – Your muscles will always have more power when you’re going down so it shouldn’t be too hard. – The pronated grip has your palms facing away from you. – The supinated grip has your palms facing towards you. – You should begin from a dead hang position, where your shoulders are close to your ears and with your arms completely straight, with retracted shoulder blades. – When you start pulling, squeeze your abs, keep your eyes on the bar above you and push your chest up. – Pull towards the bar and keep your chest in the driver’s seat, while your legs should be in a straight line with your torso as much as possible. – If your chin passes the bar or your chest reaches it, stop and observe the contraction. – Then, start lowering yourself with as much control as you can muster, until you reach the point that you started from, with your arms straight and you shoulders retracted. 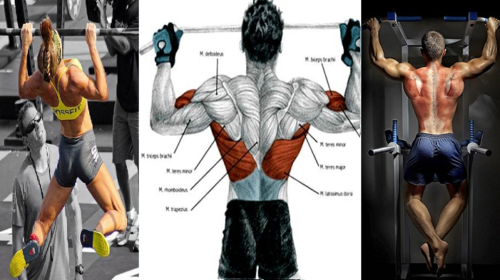 – Finally, make sure that your shoulder blades are tight because if you try to do a pull-up with a loose shoulder girdle, you might get yourself a rotator cuff injury.